Virginie Mécène (Principal Dancer, Buglisi Dance theater) is also former Principal Dancer with the Martha Graham Dance Company. She simultaneously danced in these two prestigious dance companies interpreting many roles and originating Ms. Buglisi’s Requiem, Suspended Women among others. She has directed numerous works of Martha Graham and has taught the Graham TechniqueTM at multiple national and international conferences. 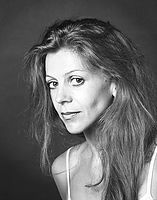 Her choreographic works as been presented nationally and internationally. She choreographed Ekstasis based on Graham‘s lost solo for the Martha Graham Dance Company, premiering in February 2017 at the Joyce Theater with rave reviews “eerie yet poignantly forthright” (Gia Kourlas, The New York Times). It was recently featured on the stage of the most famous Opera house in the world, The Palais Garnier, in Paris, performed by Etoile and Director of the Paris Opera Ballet, Aurélie Dupont. Ms. Mécène recently was awarded the New York State Council on Arts Choreographer Award, in support of a commission by Buglisi Dance Theater. Ms. Mécène holds a License Professionnelle in Artistic and Cultural Management from the University of Bourgogne, France, and a C.A.E. in Jazz from the Fédération Française de la Danse. She is currently Program Director at the Martha Graham School. She was appointed Artistic Director of Graham 2 in 2007.